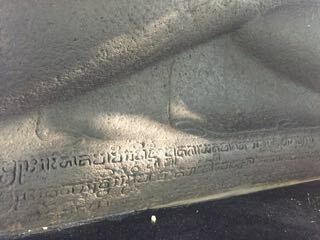 The Wurare inscription, is a Sanskrit inscription found on the base of the statue of Joko Ḍolog (literally, ‘plump lad’), now placed in a park in the city center of Surabaya. 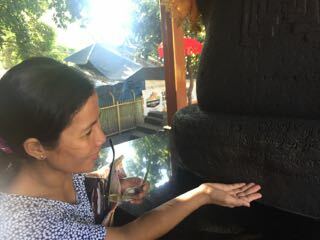 The statue was originally found in the village of Lĕmah Tulis near the town of Trowulan, which was believed to the site of the buried capital of the Majapahit Empire (1293-1527), and was moved to its present site during the Dutch Period in 1817. 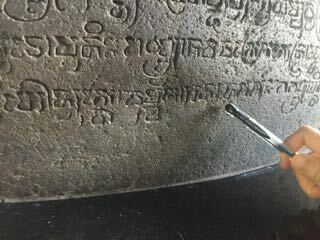 The inscription itself is dated to 1289 CE, and it informs us of a Buddhist sage Bharaḍa who drew the boundary between the kingdoms of Jaṅgala and Pañjalu to avoid a feud during King Airlaṅga’s reign in 1052 CE. 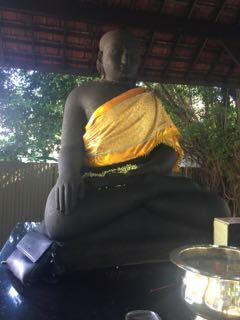 While locals refer to the statue as the Akṣobhya Buddha, scholars have speculated its true identity, which was for a long time thought to be King Kṛtanāgara (r. 1254-1292), the last and most important ruler of the Siṅhasari kingdom of Java. 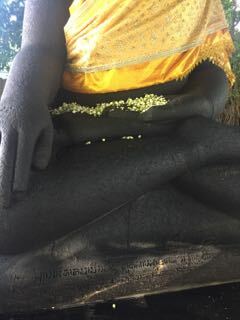 According to Gompert et al’s latest study, the statue should be none other than the Buddhist sage Bharaḍa himself as the famous Dutch archaeologist Herni Maclaine Pont first suggested in 1926/1930. According to Pont’s excavation report of this site where the statue was first found, there was a burnt wooden structure which suggests an enclosed pavilion with a religious function, together with cremation urns of bone remains of children. Piecing all the evidences together, it has been suggested that the site must have been associated with the 11th century Buddhist sage Bharaḍa’s hermitage, around which cremated remains were buried. 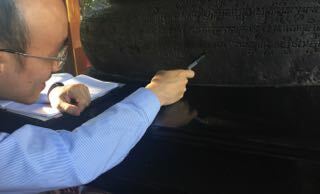 Following the suggestion of Gompert et al 2012, the name of the place should be Awurare (with the ‘a’ elided due to sandhi following a vowel in verse 13), meaning “bones of children” (awu-rare) in old Javanese. 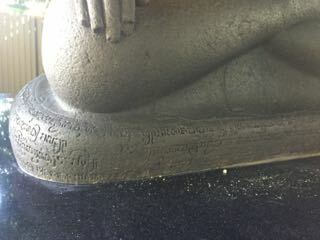 The Sanskrit inscription consists of 19 verses. I have restored the text to standard Sanskrit orthography with emendations made in earlier editions by Kern, Poerbatjaraka and Gompert et al. GOMPERTS, AMRIT, ARNOUD HAAG, and PETER CAREY. 2012. “The sage who divided Java in 1052: Maclaine Pont’s excavation of Mpu Bharaḍa’s hermitage-cemetery at Lĕmah Tulis in 1925.” Bijdragen Tot De Taal-, Land- En Volkenkunde 168 (1): 1-25.